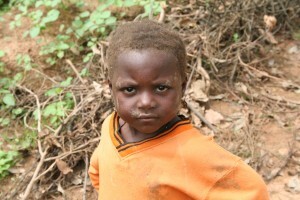 For the ‘lucky’ ones, they simply have to trek 5km to the stream each time they want more water. It is estimated that during the dry season, women and children spend an average of five hours every day fetching water! For many children this means missing school – which doesn’t worry them too much but really hampers their education. When they get to the stream, the water they collect will often be polluted and will need to be boiled or filtered before it can be drunk. Imagine the children playing … getting hot … and running to the stream to guzzle some water! 130,000 chidren under 5 die every year from diarrhoe a in Nigeria. That is one little life every four minutes!! Little wonder that when TASTE provides clean drinking water via a borehole, the incidence of illness amongst the community – especially amongst the children – is reduced dramatically. 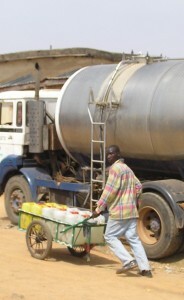 Closer to town, it is possible to purchase water – often from a dubious source – from street water sellers. They have wooden trolleys packed with 25 litre containers. But just how expensive is the water? Our captive economist tried to do the calculation!